Hello again folks. Did you try my scone recipe from my last post? If you did please let me know how you got on and perhaps share some tips and tweaks. Well, my sweet treat baking venture was shortly followed by some delicious shortbread. It is so simple but absolutely delicious and takes no time at all. I have flavoured mine with lemon zest and chocolate and/or fudge pieces. The kids go mad for them. Give them a go. 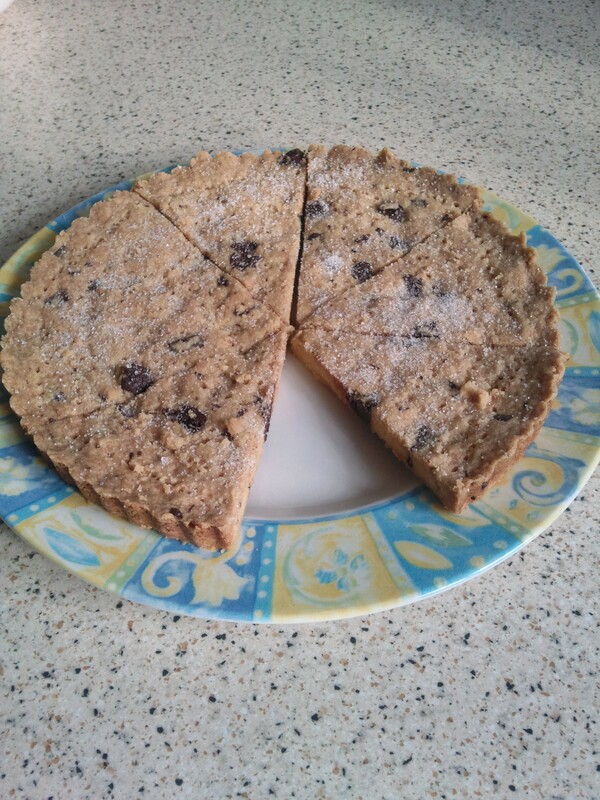 They don’t take long to make and they are so much better than shop bought shortbread. They are great for dunking in your cup of tea. Preheat your oven to 1500C/Gas Mark 2. Mix all the dry ingredients (minus chocolate/fudge) in a bowl, then add the butter and mix between your fingers till the mixture resembles breadcrumbs. Add the chocolate/fudge pieces if using then pour the breadcrumb mixture into a 23cm cake tin and press it down until it fills the tin and you have a nice smooth surface. Score the top into triangles and prick all over with a fork. Bake in the oven for 30-45 minutes until they are a light golden colour, then remove and place on a wire cooling rack. Check your scores are still visible – if not cut them again and sprinkle the top with sugar ( I use vanilla sugar). Leave to cool for 10 minutes (although I would only leave for 5 minutes if you are using chocolate or fudge as it can stick), then remove from the tin and leave to cool completely.